Mary Harriman, Founder of what is now The Association of Junior Leagues, International in New York. The Junior League of Evansville was founded in 1926 as the Child Welfare Junior Auxiliary. 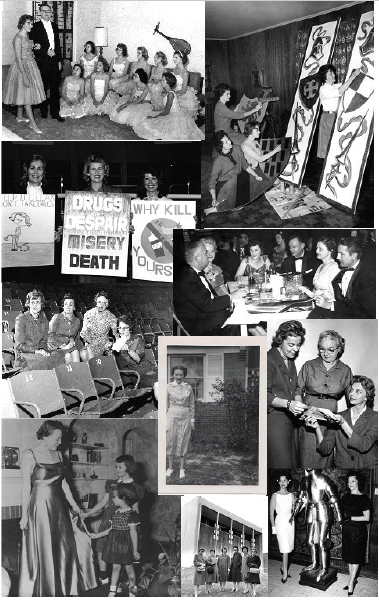 Twenty young women who had recently earned the right to vote started the auxiliary “to foster development of charitable, social, economic and educational projects; and to promote efficient volunteer service in connection therewith.” Over the past 80 years, the League has changed, but it has remained true to its voluntarism roots. In 1927, the name of the organization changed to the Junior Service League. On February 2, 1961, a telegram arrived that forever changed our organization. “Delighted to inform you of the acceptance by the Association Board of the Junior Service League of Evansville Indiana as a member of the Association of Junior Leagues of America. Our best wishes go to you for the continued success of your League.” And thus the Junior League of Evansville came into existence. Throughout our over 80 years, JLE has given over one million dollars to the Evansville community. Along with our volunteer hours and signature projects, we have changed the landscape of Evansville as we continue to better the lives of women, children and education in our community. Meetings were held on the first Friday of the month. Dues were $5 a year. The age limit for membership was set at 40 and stress was placed on the importance of attending meetings. In November 1926, the name of the organization was changed to the Junior Service League. The organization worked in conjunction with the Babies Milk Fund and the Health Center. First on their agenda was to pay for one month worth of milk which was $250. In today’s rate, that would be $3,400. The first committees were the Boehne Camp social service committee, publicity and art, motor corps, entertainment and sewing and dressing. As a motor corps committee member, one had the responsibility to drive patients to clinics and transport nurses to out-of-the-way places in their districts. This was an essential need since automobiles were still quite rare. If you were unable to fulfill your commitment, there was no backing out–you simply were required to send a taxi. How did the Junior Service League fund their projects? With a Charity Ball, of course! The 20’s version of the Charity Ball was held during the Christmas holidays. The first ball made $1,163.35. In 1929, a Packard car was raffled off. Entertainment included bridge tournaments followed by dancing. While the Evansville group was not yet affiliated with the Association of Junior Leagues, their intent was to work toward that end from the very beginning. Mrs. Robert Viehe was the first president with Mrs. Leroy Foster, vice president, (Sustainer Emeritus Diane Igleheart’s mother); Mrs. John R. Stanley, treasurer and Miss Louis Andres, secretary. The 30’s brought the depression and need for entertainment. The League branched into wrestling, children’s theatre, follies type shows (which continued until 1979) and the addition of Cigarette Girls who were 8th grade daughters of members, to sell cigarettes, mints and flowers at the Charity Ball. Our impact and service to our community has touched generations within Evansville for over 90years. During the 40’s, the admission process began. A prospective member had to live in Evansville for one year and be between the ages of 18 and 35. She had to be proposed by a current member. The Admissions committee then voted in a secret ballot, and it took 7 of the 10 votes to become a new member. The Provisionals then participated in two training sessions a week for six weeks. At the end of the sessions, they had to write a paper on their research. The paper was then presented to Mr. Turner of the Community Chest. He then passed or failed the Provisionals and gave an award for the best paper. Being admitted to the League was a huge event in a woman’s life. Some women were even known to move from Evansville if they didn’t make it into the League! The ’50s brought the Horse Show. a three-day event at the Audubon Park Raceway. The Child Guidance Center was a large part of the charitable giving. It was a place where children could obtain treatment for emotional or psychological problems. On February 2, 1961, a telegram arrived that forever changed our organization. “Delighted to inform you of the acceptance by the Association Board of the Junior Service League of Evansville Indiana as a member of the Association of Junior Leagues of America. Our best wishes go to you for the continued success of your League.” After applying 3 times that included a 6 year probation period, the phone began ringing all over the city to carry the good news and to invite the members to a celebration. The meetings were still held during the day but it was during this period that they added nightly meetings due to so many league members working outside of the home. They also added a new fundraiser, the Rummage Sale. 1970 started with a fire in the JLE office losing all their paperwork and files. JLE turned their attention to creating many new projects that have changed the landscape of Evansville including the Reitz Home, Wesselman Woods Nature Center and Swonder Ice Rink. One of the most popular fundraisers began in the 80’s, Festival of Trees, with over 18,000 people visiting the first year. The community projects included Bucket Brigade, a tutoring program, and Ark Crisis Prevention Nursery. In the 90’s the Hands On Discovery exhibit opened at Eastland Mall for a three month run. With overwhelming interest and support, JLE opted to stay open for another year. By 1995, Hands On was in a permanent location at Washington Square Mall. It is now known as the Children’s Museum of Evansville. Other projects started during the 90’s were the “Over the Rainbow” playground at Wesselman Park, Little Lambs, EVPL Bookmobile and restoration and lighting of the cupola on the Old Courthouse. In 1995, for the first time ever in JLE history, a member no longer had to go sustaining at the age of 40. The age requirement was lifted and in its place was instituted a requirement of seven years of active service to become a sustainer. Also at the same time, Done-in-a-Day projects made their first appearance. A Sustainer Advisory Board was established to give the sustaining members a voice to the JLE board of directors. The first Helen Klamer Philp Award was presented to honor outstanding sustainers for their community work outside the League. The 2000’s brought JLE their very first website. We also added JLE logowear along with a scholarship honoring the late Meg Dettwiler. A new fundraiser began with the Once Upon a Time: Recipes and Recollections of a River City cookbook. The cookbook debuted at the first ever Idea Home. The Idea Home was a project of Tucker Publishing and gave JLE the opportunity to host the tours and receive the money from the proceeds of ticket sales and a gala. And the highest grossing fundraiser ever, the 2002 Charity Ball, made $65,000. We established the Holiday Mart and Experience Evansville fundraisers as well. Planning began on our next signature project in 2002. In 2005, Playville J.L.E. opened at Deaconess Gateway Hospital and St. Mary’s Medical Center. The rooms are a haven to children who are in the hospital, to help take their mind off of the pain they are going through and to help them smile. In the 2010’s, our fundraising goals are impacting healthy lifestyles with the Rockin River City Ride, a bike ride utilizing the Greenway. The Battle of the Bands was paired with the bike ride and then changed to the GLOW Run. A Fairytale Luncheon was held to celebrate the 10th anniversary of the cookbook with an event made for kids that included princes, princesses and even a pirate. Two new fundraisers, Fall into Fashion and Confessions of a Shopaholic, were added. As we celebrate our rich history for the past 90 years, we are proud to be women building better communities!